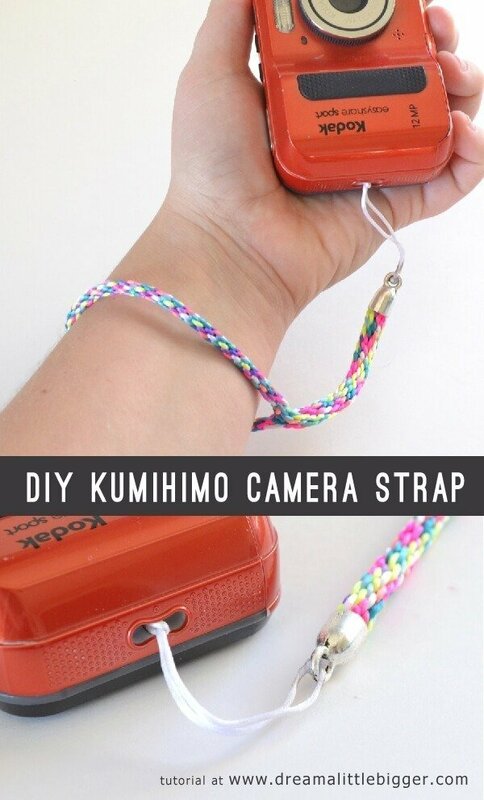 Today we’re going to put Kumihimo to good use by making a Kumihimo Camera Strap. I’ve been wracking my brain lately for some functional ways to use Kumihimo. I was inspired before I even started to make functional things with the technique after learning that it was how Japanese Samurai Body Armor was made. How neat that something functional could come from something so artistic and pretty! Now I don’t need a suit of armor nor do I have the patience or attention span to make something that labor intensive so I set my mind to other things. And then I remembered my little kind of junky camera that I bought years ago for a water vacation. This camera is water safe and I can take pictures under the water which is pretty darn nifty. The quality of the pics is fine for some candid water shots but for every day pics they are far to grainy. And it seems this thing was built to withstand small children dropping it and accidentally smashing it into corners of walls while carrying it around. Since it is so sturdy I let me nephews use it whenever I’m around. I like to see the pics of things they deem important enough to document but I don’t have to worry about my good camera (or even my okay back up camera) being messed up. But they don’t like the bulky foam wrist strap that prevents my waterproof camera from being at the bottom of the wave pool at the water park. So it only seemed to make sense to try to whip one up Kumihimo style! In the end, it worked out super well. And while I lost a few pictures somehow, I’ll use my words where I have no images to share the process. 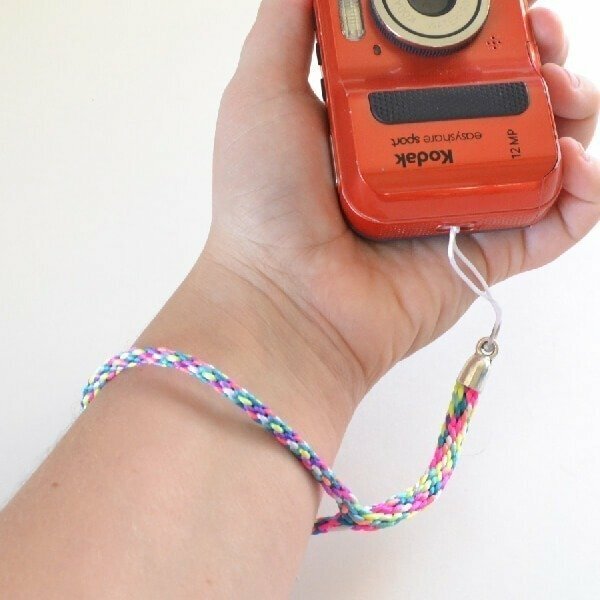 To start the project you’ll want a braid along the middle of the cord. Tie a knot about 17 inches in on one end of your bunch of 8 pieces of rattail. Place in your Kumihimo disc and start braiding from there. It’s awkward to have such a long tail hanging down but it’s no biggie. Stretch the cord as you work. The portion that is being made now is going to be the loop that your hand fits through. Since I was tailor making this for the hands of children, I made my cord about 7 inches. Test the cord as you work for a good length for you. When you get your length tie off the new end. 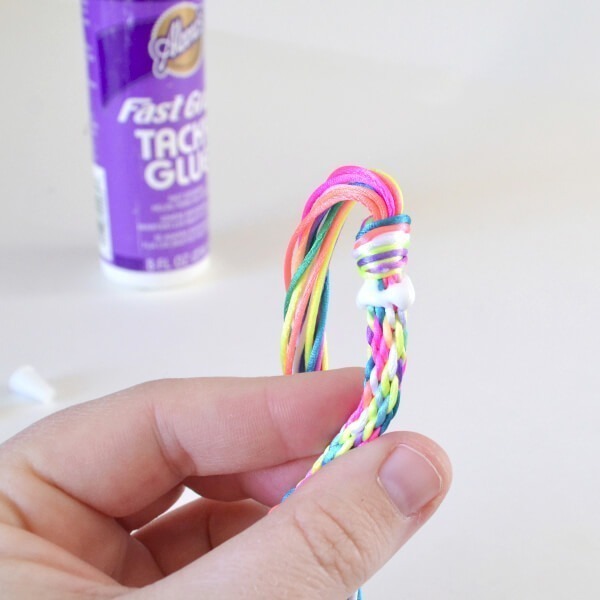 Rub a good amount of glue into the braid around the knots and allow to fully dry. And don’t be shy, really massage that business in there but take care NOT TO GET GLUE INTO THE KNOTS. When dry, undo the knots. 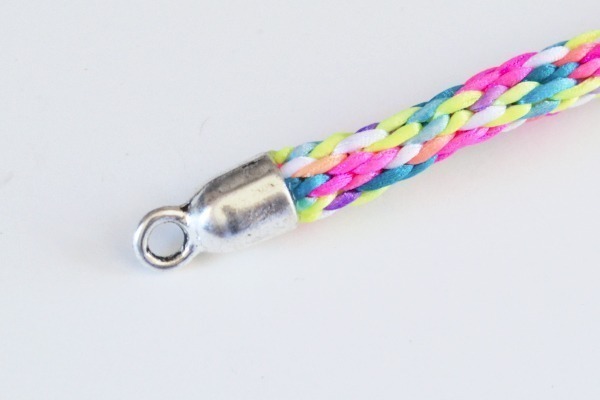 The glue holes our braid with out any unraveling. Take where the braid ends on each end and place together. 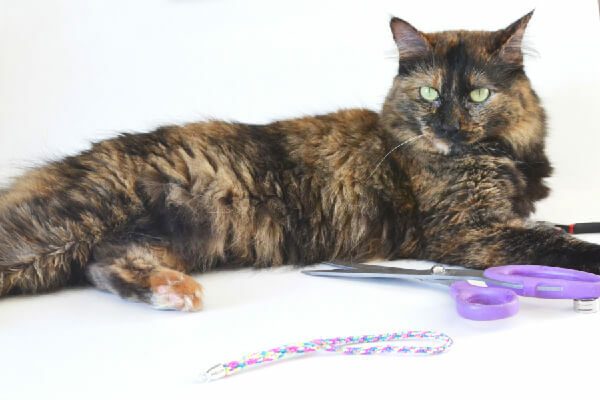 Use a metal tie like you use on trash bags or some yarn and very tightly bind together making sure where the braid ends is flush on both sides. Load the strings up into your Kumihimo disc. Since we have two 8 strand braids coming together, we’re going to make a 16 braid to finish it off. When putting the strings into the disc, try to place each cord where it seems that it naturally fits the best. In other words, if one would comfortably fit at 16, don’t try placing it at 8. While loading up make sure the ends of your previous braid are flush with the top of the disc. This keeps from having any weird beginning/ending from the two 8 strands to the one 16. Prepare to be patient. I had to start and undo my braid 3 times before I was able to figure out how to get the two braids to come together neatly. Because cameras are kind of heavy, I used a good amount of E-6000 glue in my end cap and allowed it to dry a full week. I have found the longer end caps sit, the less likely they are to come apart when being used. Since we’re going to be holding an expensive little gadget, I used caution with the full week, but do as you see fit. 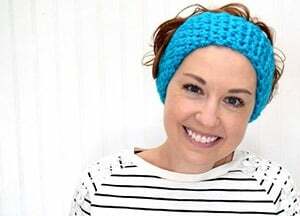 To attach take a length of your rattail of anywhere between 3-5 inches and double knot the end. Hit with a little to melt together and really reinforce the knot, but take care as too much fire will actually make the cord brittle. 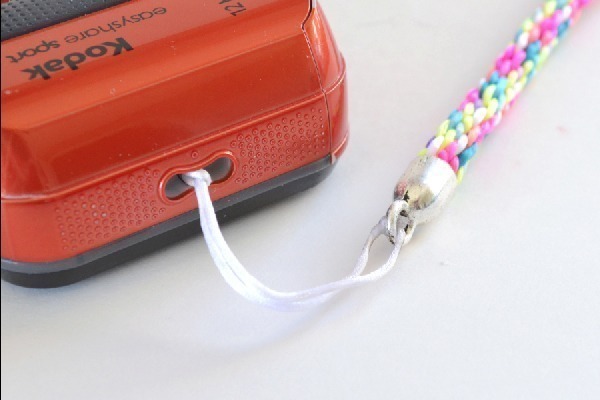 To make my knot even sturdier, I glued it into the loop on my cord end and allowed to dry before stringing the cord through my camera. 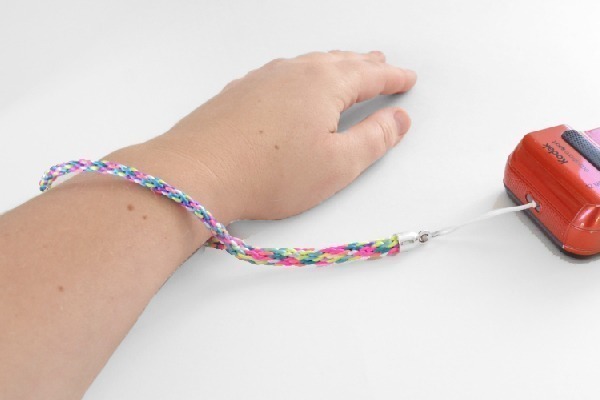 Now the cord is tight on my arm but I’m not going to be the one using it (If you’re wondering how I can wear it at all, I have been told I have freakishly small wrists). 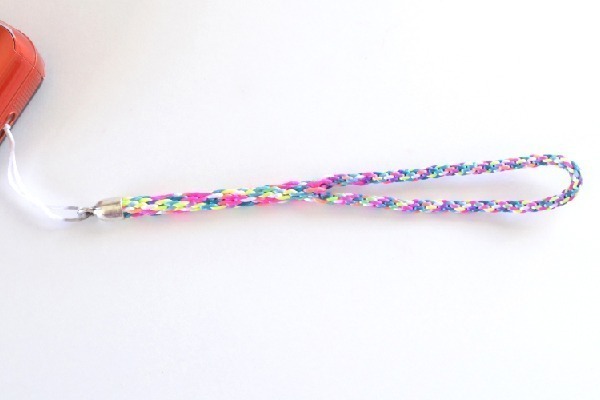 The cord itself is really pretty and used up some neon variegated rattail that I bought online and didn’t like once I saw it in real life. It’s also incredibly sturdy which was my fist concern with the project. And any time I have the cord out I always have one or more kitty craft assistants. Say hi to Liddy who just happened to plonk down in the middle of photo taking! In the end I love the results I got and plan on playing around with a few different variations. It takes A LOT of cord and rattail isn’t exactly cheap so feel free to practice with cord that maybe isn’t the color you wanted or whatnot. Or, you could use yarn or whatever strikes your fancy. 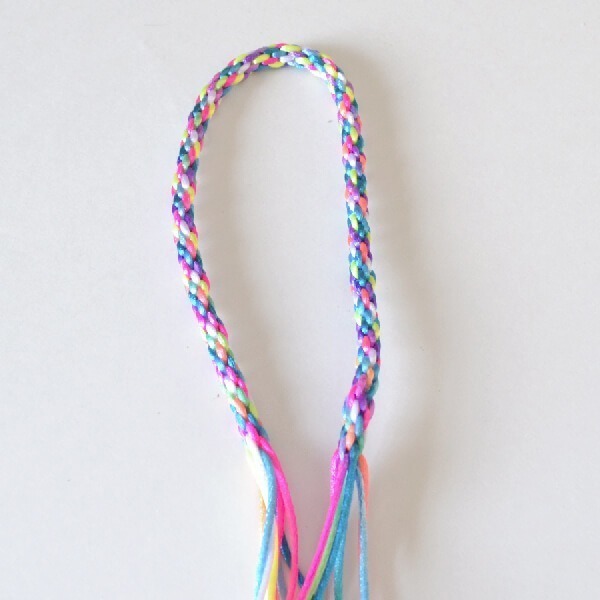 Have you been trying to figure out other projects for your Kumihimo braiding? I’d love to hear about it! Hi Allison! I found your site when you left the sweet message about the monogrammed glasses on my site. I am glad I found you, you have so many great ideas! 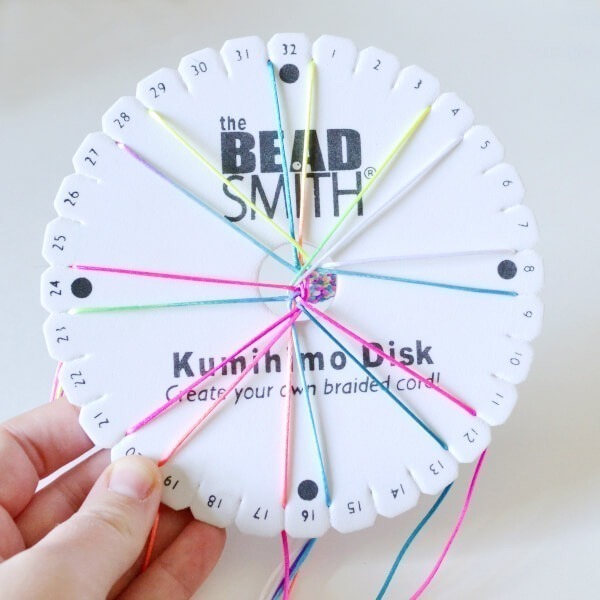 I love this braided cord, I had no idea the kumihomo disk even existed until I saw this post. Hi to Liddy, I can’t wait to see more of what you and kitty come up with!